BBC had the manic Monday and made ours marvelous by bringing up the cam about 1pm. The team at BBC spent all day Sunday and Monday getting their WirelessISP infrastructure back online after the nasty storms of Saturday night. This included moving generators to tower sites to provide power, teching all the gear to make sure it was working properly, and rebooting the servers that get the signal from the cam to us. This heroic effort paid off and BBC is back online and the cam is back up for us to enjoy. All hail BBC for a job well done! 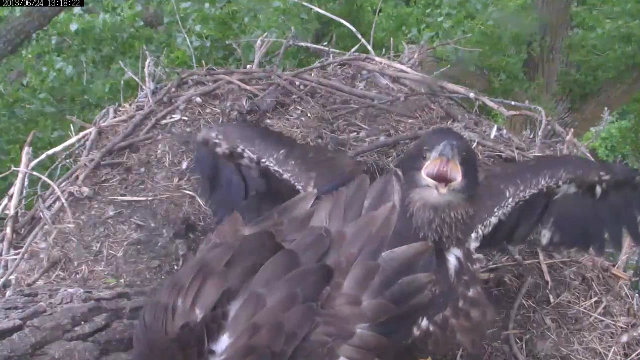 When the cam came back up we all felt empty nest syndrome hit. The kids were nowhere to be seen! About 2 mins after the cams return Harmony came down the trunk and we were treated to our first glimpse of her after the down time. We could also see that the nest came through the storms with nary a twig displaced. It seems when the cam came back up both Harmony and Peace were taking in the view from their new fave place to be up on Dad’s patio. BBC panned for us a bit just after the cam came up and later in the afternoon. They showed where the kids are hanging out and left it there for a bit. Both eaglets went down to the nest when a parent brought in a snack and we were left counting cars and trucks on the road south of the nest. Harmony eventually came back up to grace us with her presence and the chatters were yelling for her to move so they wouldn’t miss any cars. Later in the evening BBC panned back to our normal view and we watched Harmony and Peace getting ready for bed and playing on the nest. As darkness fell we were all grateful the cam was back and we could see our young friends again. On to the pics and vids of the day. All that climbing make ya sleepy, Peace?? Yo, dude, point that somewhere else!!! Is Harmony making a silly face again?? Whats a girl have to do to get a little privacy around here??? Boy, Mom sure flies good. You really should get a Mac. PC's are so passe'. Well it was a good start to the week with the return of the cam and seeing that both Harmony and Peace had expanded their horizons. Thanks again to BBC for the great job getting us back online. A bop of the branching branch to Razzle and BBC for the great vids and pics again today! Thanks! Hope you enjoyed your Monday and we’ll see you here tomorrow!